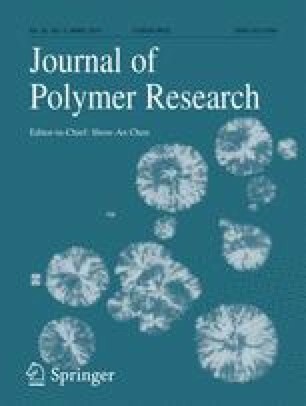 The bulk copolymerization of methyl methacrylate (MMA) with vinyl monomers initiated by ε-caprolactam (CL) and n-dodecyl mercaptan (RSH) was investigated. Acrylonitrile (AN) and vinyl acetate (VAc) were used to copolymerize with MMA at 90 °C in the presence of CL and RSH, respectively. As evidenced by first-order kinetics of polymerization, linear increase of molecular weights with monomer conversions, and relatively low PDI values within a range of 1.3 to 1.6, both the copolymerization reactions exhibited living characteristics. Dependences of the copolymerization on the monomer feed ratio was also studied. An increase in the feed ratio of MMA induced an increased rate of copolymerization. In contrast, an increase in the initial loading of vinyl monomer leaded to the decrease in rate of copolymerization. The reactivity ratios of each pair of comonomers were also assessed using Fineman-Ross (FR) method. The results showed that the CL has an important influence on the kinetics of copolymerization, which caused the copolymerization parameters different from the most previously reported values. The financial support of the Ministry of Science and Technology of the Republic of China (MOST 106-2218-E-006 -022 -) are gratefully acknowledged. The authors are grateful to Ms. P.Y. Lin for her crucial contribution to the 1H NMR experiments.